Dr. Toni Luisa Rivera Clues You In on What Your Body is Trying to Tell You. She was a whirlwind of a doctor. The only chiropractor on a remote part of Puerto Rico, she was inundated with patients, many of whom were out of pain for the first time in years. Wanting to heal EVERYONE, she drove herself to extremes. But what really drove Dr. Toni Luisa Rivera was buried so deep that only in her 30s were the memories really starting to offer clarity—repeated sexual assaults before the age of four, a heart crushed by a mother so overwhelmed with the truth that she couldn’t find it in herself to comfort her daughter and a burning desire to be of value, to prove her worthiness. It was a recipe for disaster and it was only through listening deeply to her own body that Rivera found her way to physical, mental and emotional health. And it is this deep listening and intuitive technique that Dr. Toni offers her readers in her new book The Propelled Heart: Moving from Injury to Insight. Part memoir, part healing guidebook, Rivera tells of her passage to insight, allowing injury to transform into the gifts she brings to the world. Rivera recounts how she listened to her body’s physical pain to help unlock those wounds of forgotten childhood sexual abuse, freeing her to follow an inner-driven, more deliberate, more intentional and joyful way of life, while still serving those who needed help. Always an adventurer, she soaked up knowledge and experience to enhance her skills, but it was in taking a workshop by the renowned Ilana Rubenfeld, founder of the Rubenfeld Synergy Method (RSM), that Rivera found her first real key. Rubenfeld taught her how to feel the pain completely and interpret the wisdom and guidance in that pain. She discovered how to get life-changing answers. Rivera explains how her growing knowledge, and willingness to listen to her intuition, laid the groundwork for her unique healing practice in New Mexico today, that guides and counsels people individually on critical methods to listen to their bodies as a means to achieve total wellness and a fulfilled life. She also trains other practitioners in her technique. In the second part of The Propelled Heart, Dr. Toni offers insight on body wisdom, complete with exercises that the reader can conduct to deepen one’s ability to hear the messages and tune in to intuition. Rivera also brings to light critical issues that are often at the heart of someone’s physical, emotional and spiritual pain…and how someone can begin overcoming blockages in those areas. The Propelled Heart: Moving from Injury to Insight, priced at $14.95, is available from Amazon.com. Monika will help get answers to your questions related to healing, dreams and visions. This show will help clear the common doubts that new healers have and also someone who's planning to be on the path of healing. How can dreams and visions be signs we need to watch for. We will also do short healing meditations and send peace to those who are in need. 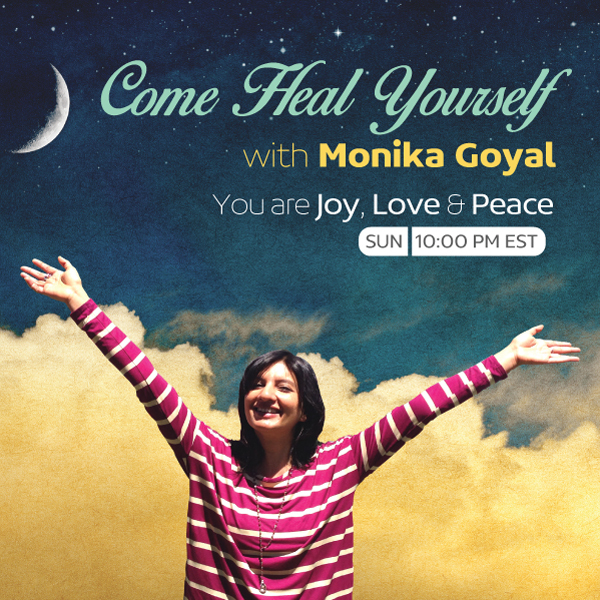 Monika Goyal is a certified Angel Therapy Practitioner and a Psychic/Angel Tarot card Reader and has been practicing for 8+ years. She is a Hypnotherapist and has helped heal several people through Past life regressions. She does private healing sessions using various different modalities of healing including Reiki, Theta and SED and teaches ascension and healing workshops on a regular basis. She is also an Earth Acupuncturist and does deep Land/Property healings. She connects with you at very deep level and provides guidance and healing according to your needs. I want to help introduce people into a way of thinking that will offer them freedom in their lives. Freedom to truly live like they are dying. My hope is to help transform lives by simply helping people accept the nevitability of their own death and to help them realize that by accepting their death and the death of others that it opens them to truly “Live” life. To experience it without the fear of death lingering over their heads. This is not to say that they go to extremes but that they are able to be in the moment. To live in the here and now and to accept their life as it is showing up so then they can make any changes they feel necessary to improve their lives. My professional credentials come from personal experience. I am a Reiki master and through that profession have assisted people in removing emotional blocks which were hindering them in experiencing the beauty in life. I also completed all the work for a Masters degree in counseling but realized before completing my internship that traditional counseling was not my medium to create change in the world. I then ventured on to a spiritual medium to deliver my services which is when I began my Reiki training and the completion of my Master Degree in Metaphysical Science and my PhD in Philosophy and Holistic Counseling. My true credentials however come from how I live my life, who I am being in the world. I have personally conquered my fear of death. It is not to say that I want to die but the fear has no effect on me, I accept death as part of life. I live my life trying to make each life I touch better than when I found it or at least I try to do no harm. It is the person that I am being in everyday life that qualifies me to help others. I live what I speak and although I may not be perfect, I try my best to live my life like I am dying. I forgive others when I feel they have wronged me, I ask for forgiveness when I feel I have wronged them, I live in the here and now, and I spread peace and love to those around me. The basis for the book came from the experience I had when I helped my brother who was dying from cancer. I spent his last days with him and was able to assist him in finding a way to accept his inevitable death and to truly live out his final days. He was such an inspiration watching him transform from a hateful, angry alcoholic to a loving, kind dying man. He said he experienced more peace in the last days of his life than he had throughout his life. I wanted others to have that same experience. Since the years that he passed, I have assisted many people through the dying process and it seemed like the same things kept coming up for each case so I decided to try to write a book that accumulated all the knowledge that I acquired. The Joy in Dying is what I came up with. It is a simple outline of how to apply basic techniques to the dying process. To assist people in discovering what really matters in life and to show them a way to not only die in peace and love but live life in peace and love. Pioneering doctor offers sweeping solutions that Washington needs to hear For decades he’d been a frontline witness to the failure of America’s health care. Then he founded the Health Medicine movement. Next he opened one of America’s first integrative medical clinics. Len Saputo, MD, a 1965 graduate of Duke University Medical School, is board certified in internal medicine, and was in private practice in affliation with John Muir Medical Center for more than thirty years. After his awakening to the deep flaws in conventional medicine, Saputo developed a new paradigm that is now known as integral-health medicine. Len founded the Health Medicine Forum in 1994, and went on to found and direct the Health Medicine Center in Walnut Creek, Californiaone the first integrative clinics. Len is the coauthor of Boosting Immunity: Creating Wellness Naturally (New World Library, 2002; has edited six books, including Beating the Years and Boosting Your Digestive Health. “A Return to Healing: Radical Health Care Reform and the Future of Medicine” published in Sept. 2009. Origin Press. Byron Belitsos. Won the Nautilus Gold Award for the best book in health and healing for the year 2010. Where most teenagers are worrying about wearing the right lip color, or following the right YouTube star, Courtney Amundson is only worried about whether the messages she is astonishingly being delivered from the Divine are reaching enough people. Because Courtney was a mere 16 when she began following in the footsteps of Esther Hicks, Jane Roberts, Edgar Cayce and JZ Knight as an extraordinary powerful channeller. Now, a ripened 19 and wise beyond her years, she is introducing to the world Teachings from God, Greeting Your Soul and Revealing the Divine Within, a book of loving channeled wisdom brought forth to light mankind’s path in challenging times. And now those messages are compiled in Teachings from God. In reading the words, the reader experiences an immersion in love, compassion and encouragement. It’s as if you have your own heavenly cheerleading squad, heartening you, gentling nudging you in the direction of life-affirming choices. Through Courtney, the guides offer a perspective of one’s place in the cosmic landscape and how we can make the most of our time here on Earth while enhancing our eternal energetic footprint. The book postulates a path to greater happiness, self-acceptance, understanding of ourselves and how we can make a difference by “sharing the truth, holding the love and sharing our magic.” The guides point the way toward getting into the natural flow and rhythm of life so that life becomes easier, more satisfying and more divinely guided. The book makes the reader remember our Oneness with all and encourages us to step fully into the awareness of living live as part of the greater whole. The essence of Teachings from God is to uncover our true nature, the divine within, that once discovered will launch every person on a path of empowerment. The teachings help seekers to find, discover, remember the limitless aspects of human capacity so that we can attain more freedom in our daily living. Free from limiting beliefs that hold us back from our potential. Free to create outcomes that we dared not imagine previously. Free to live unencumbered, for those who dare to lift the veil. Courtney Amundson is a young woman on a mission that is far more ambitious and well beyond the goals and objectives of most of her peers. She is standing on the shoulders of legendary channellers bringing forth life-changing and planet-changing information in Teachings from God. Every page in her book is filled with the love and wisdom that is meant for us to transform, grow, and heal ourselves and the world in which we live. Teachings from God, Greeting Your Soul and Revealing the Divine Within, priced at $19.99 for trade paperback,is available at Amazon.com. Unlock Your Hidden Feminine Power To Bring Balance To an Overly Masculine World. Are You Highly Sensitive, Creative and Empathic or Feel Out of Place? You May Be an Indigo Adult In Need of Spiritual Healing To Embrace Your Divine Difference! Why do some people feel disempowered and disconnected in a world they deem utterly absurd? This is what spiritual counselor and coach Yol Swan kept asking herself through more than 30 years exploring the psychological and spiritual aspects of the mind. In her new book, The Indigo Journals: Spiritual Healing For Indigo Adults & Other Feminine Souls, she shares her story and practical system of spiritual healing with a variety of tools to help the sensitive, empathic soul types who feel hurt and out of place, yearning for emotional freedom and a sense of purpose. Swan felt different, like a stranger in a strange land most of her life, even after many years in psychotherapy and on the spiritual path, personally guided by enlightened teachers from both Buddhist and Hindu traditions. When she finally understood that she was an Indigo adult giving individual expression to the wounded Feminine on the planet, she also recognized that some of her counseling clients were Indigo adults while most shared Indigo traits but lacked certain key features. This led her to a deeper exploration of the soul and the discovery of a Feminine-Masculine Soul Spectrum that explains essential differences between the many soul types inhabiting the Earth as well as the extreme polarization resulting from them. Rather than focusing on the color of the aura, which isn’t fixed, she classifies Indigos as feminine souls with certain masculine aspects who can be placed toward the middle of this Spectrum, representing the indomitable creative impulse of the Divine Feminine. She explains the warrior-type, goal-oriented characteristics that distinguish Indigos while exploring in detail the receptive, sensitive, empathic, and intuitive qualities they share with other feminine souls. After sharing her personal journey, messages channeled in her journals since adolescence, and cosmic memories of Atlantis, Swan examines the dynamics that distort the creative power of the Feminine and encourages feminine souls to embody a healthy Indigo archetype to develop emotional and spiritual freedom. For this she provides deep insights and step-by-step guidance to integrate the Feminine and Masculine within the body-mindsoul- Consciousness continuum. Since the Feminine has become increasingly wounded, healing the feminine soul requires great self-awareness, self-discipline, and creative focus to transcend the negative tendencies and karmic ties we’ve accumulated, both individually and collectively. Instead of trying to heal through relationships or external validation, simply reaffirming codependent patterns and giving away our power, Swan gives us the tools to release both recent traumas and those imprinted in our DNA, to embrace our divine differences and take full spiritual responsibility for our experience by mastering the aspects of the mind that shape our perception and create our reality—our personalized life-movie. Although centered around the wounded Feminine and Indigo archetype, this book offers an in-depth exploration of the soul and a practical spiritual healing system that can benefit anyone willing to look within, to harness their inner power and nurture a more feminine, soul-guided, 5th-dimensional experience of life. Yol Swan is a spiritual counselor and coach with degrees in English literature, music and homeopathy who has taken the understanding of the soul and the wounded Feminine to new cosmic depths in her new book, The Indigo Journals: Spiritual Healing For Indigo Adults & Other Feminine Souls. Born in Mexico to intellectual parents and surrounded by a blend of Shamanic cultures, she is a modern seer who perceives life as energy and is highly sensitive to other dimensions. She began channeling spiritual messages in her teens and later spent many years in psychoanalysis, which launched her into a deep exploration of Divine Consciousness during a 3-year retreat in almost complete isolation. First initiated as a Buddhist nun by a liberated master from Thailand and then into a path of meditation and mantra by enlightened Hindu teachers, her life is filled with mystical experiences, unusual encounters, and profound insights into the power and workings of the mind. A painful divorce brought up memories of Atlantis and revelations of the distorted Feminine, as well as the recognition of being an Indigo adult. This led her to a deeper exploration of the soul and a soul typology based on the cosmic interplay of the Feminine and Masculine, raising a new paradigm to explain essential differences between humans and the polarized world resulting from them. With a practical system of spiritual healing and energy management developed over more than 30 years, she helps clients around the world to create an empowering life or business they love, in alignment with their soul. She currently lives in the mountains of Western North Carolina. Book Available at Amazon.com, BarnesandNoble.com, iTunes and in select bookstores through New Leaf Distributing Co.
Why So Many Lingering Illnesses and Conditions Persist – Matters That Can Be Treated When the Right Thyroid Tests Are Administered. If you’ve tried time and again to lose weight after the holidays, but have been stymied, you may not have been looking in the right place for answers. Beyond diet and exercise, the problem could be thyroid. But your usual battery of standard thyroid tests may not detect the problem. Dr. Gil Kajiki, the nation’s leading expert in non-drug treatment for hypothyroidism, low thyroid and Hashimoto’s disease and founder of the Valley Thyroid Institute, a worldwide treatment center, says that not just weight issues–but many other illnesses and conditions–can be effectively treated when the right tests are applied. There is no one-size fits all solution to thyroid dysfunction. Without the distinctive legion of tests that Dr. Kajiki has identified, most doctors miss the signs and are mystified at why patients aren’t getting well. To find the right treatment that pinpoints the specific root cause of a patient’s thyroid-related ailment or auto-immune problem, Dr. Kajiki created the internationally acclaimed Kajiki Protocol. He engages a wide variety of testing procedures and indicators, including: 11 different thyroid tests instead of the standard three, inflammatory blood markers, immune system challenges, gastro-intestinal microbial, leaky gut testing, adrenal dysfunction, urinary hormone metabolites and more. Dr. Kajiki is a Certified Functional Medicine Practitioner, Chiropractor (C.F.M.P., D.C.) and patient educator with clients on 4 continents. His clientele include celebrities, corporate leaders, women stressed by family life and work, computer programmers, athletes, homemakers, radio show hosts, admin assistants, health practitioners and doctors. At the Valley Thyroid Institute, he and his staff are revolutionizing the way that hypothyroidism and Hashimoto’s Autoimmune Thyroid are diagnosed and corrected using drug-free solutions. Dr. Kajiki creates his personalized program with personalized dietary changes, nutritional supplements, vitamins, minerals and enzymes and lifestyle enhancements to improve lab test results and reduce symptoms. His quest for solving the thyroid conundrum arose from personal experience. His wife Kim was diagnosed with Epstein-Barr syndrome, suffering from extreme fatigue, fevers, hair loss and had bouts of malaise. She required frequent B-12 shots just to be functional. These bouts of illness continued over the next several years and by 2007, new symptoms had appeared: sweating and heart palpitations at night, digestion disturbed by abdominal bloating, gas and swelling and a 50-pound weight gain. As her health continued to decline, including trips to the hospital, her M.D.s didn’t have any answers. Dr. Kajiki set out to researching a solution himself and put together a variety of tests that finally pointed to Hashimoto’s disease—and the only solution offered by Kim’s MD was lifetime thyroid hormone replacement. Knowing there had to be another way, Dr. Kajiki created the life-saving protocol that completely healed his wife. It opened the way for an entirely new focus for his practice. Individuals wanting to know more can avail themselves of a couple of useful resources—a free report on Dr. Kajiki’s website (http://www.valleythyroidinstitute.com/the-free-report/) and an educational five DVD series of self-help for patients with chronic thyroid problems: “The Thyroid Mystery Solved,” created with leading radio and TV show host Lisa Garr. It offers a wealth of vital information for just over $100. Dr. Kajiki also offers a free 15-minute consultation to determine if someone is an ideal candidate for the Kajiki Protocol. To reach Dr. Gil Kajiki and the Valley Thyroid Institute, visit: www.valleythyroidinstitute.com/schedule or call (888) 605-8220. What Would Life Be Like If Everyone Acted for the Greater Good? What would life be like if nearly everyone acted for the Greater Good? If the world’s “trustworthy,” caring and consciously aware people-those who don’t act from selfish motives-got together and welded their power and discernment by majority vote? Potentially, they could influence elections; boycott corporations and industries that are injurious to global health; force government representatives and employees to truly serve the people and not their fiefdoms; reset the global economy; demand peace from the world’s powers; put love first in all exchanges-in other words–change the course of the planet! “Idealistic? Yes. Realistic? Maybe. It’s a starting point,” says Dane Starland, author of two new books that inspire people to join the movement he has initiated, United Earth Ecclesia (UEE). His books The Earth Citizen’s Guide to Co-Creating the Greatest and Highest Good and UEES or Not UEES-That is the Question invite people to step away from the life of struggle and strife and commit to joining with others to co-create a saner, gentler, more abundant world where the NICE PEOPLE lead! Starland’s first book UEES or Not UEES-That is the Question takes you in to a world where UEE membership ensures that you can trust doing business with, dating or interacting with fellow members because they share your values. It presents two nearly identical scenarios-one where Jane, the protagonist, experiences a day without UEE influence-and then the same day where she is supported by, aided and shares experiences with other UEE committed-individuals. This short novel is much like the film Ground Hog Day with a different kind of outcome! Duane Stjernholm (pen name Dane Starland), the proud founder of the UEE, has degrees from both Colorado State University and Iliff School of Theology. He backs his proposals and visions with a lofty degree in both Psychology andReligious Philosophy/Metaphysics. Join Cyndie Lepori, the Dolphin Emissary. Do you need more Joy in your life? Are you caught in the nets of Chaos and feel stressed and unsafe? Find out how to clear blocks to your health and happiness quickly and easily the dolphin way. Each exercise is quick, fun, and easily with immediate results. She will be doing some Quantum Readings to demonstrate how quickly old energies and programs you are running in your life can be transformed! What is Ascension? How does it affect me? How can I create a flow of abundance? How can I be Joyful? How can I create love in my life? Cyndie will be sharing with us information that she has received through channelings over the last 20 years to help answer these questions and more. * Feel like you are spinning in place? We will be talking about safety, stability, and how to create it for yourself. * Are things in your life not working like they used to? We will be sharing how it is all working now that we are further into the New Earth Frequencies. * Why am I stuck? We will be doing exercises and play to demonstrate how to align with the new frequencies and how to instantly shift into alignment with the life you want. * She will share the current trends she is seeing. * She will share the importance of all 4 levels of creation in our lives, from the physical to the spiritual. Cyndie Lepori is an internationally renowned reader, channel, speaker and best-selling author.. She was chosen to be in the World Wide Who’s Who directory for her contributions on behalf of the dolphins during the Gulf Oil Spill. Cyndie is a Retired RN with a BS degree from Mississippi Southern and Ascension Reiki Master Teacher. She is an Animal Communicator contributing to Species link monthly. She is on the Spirit Rescue Team for clearing properties and Radical Joy for Hard Times Team. She has created gatherings all over the world for Beach Activations to heal the waters of the Earth. She works with the Cosyn Group to facilitate grid activations and bring in the new frequencies to the earth from Source. Dolphin Energy Practitioner/Healer Level II. Certified by Dolphin Heart World. Certified by the Dolphins as an Emissary to facilitate Blue Star Dolphin Attunements and Transformational Weekends and play shops. As the Dolphin Emissary, Cyndie contributed her chapter and channeled the conclusion from the dolphins to the Amazon Best Seller Dolphins and Whales Forever. She has written Bubbles and Billy Sandwalker to assist the children and grownups to better understand the gifts spirit and the dolphins have provided for us. Her blog talk radio show is under Dolphinhugs4u2. Her films on youtube are viewed and shared worldwide. For further information please go to www.dolphinhugs4u2.net, contact me at dolphinhugs4u2@gmail.com or call to set up a time for Quantum readings, healings or clearings at 601-466-6559. Thank you! I am honored to have Liane Buck and Christopher Buck as our show guest today. As Founders of OM Times and Humanity Healing. they are truly selfless spirits. Let’s learn what Compassion is all about and help Heal Humanity.